Raw Materials : Iron ore,copper ore,cement,artificial sand,fluorite,limestone,slag,etc. VC series sand making machine is Yifan Machinery Product Development (vertical shaft impact crusher), over the years combined with new sand gravel plant engineers in the use of the customer experience professional development of traditional Sand molding equipment problems. Material from the hopper into the sand making machine, the sub-feeder the material into two parts, the middle part of the sub-feeder into the high-speed rotation of the impeller, the impeller being rapidly accelerated up to several hundred times its acceleration of gravity, then to 60-70 m / sec from three uniform impeller flow channel within the projectile out, first of all with the sub-feeder four weeks from the closing down part of the material impact crusher, and then with the impact of vortex cavity lining materials on branch , is the material lining rebound, oblique impact to the whirl chamber at the top, but also to change its direction of motion, deflected downward movement, emitted from the impeller material to form a continuous material curtain. 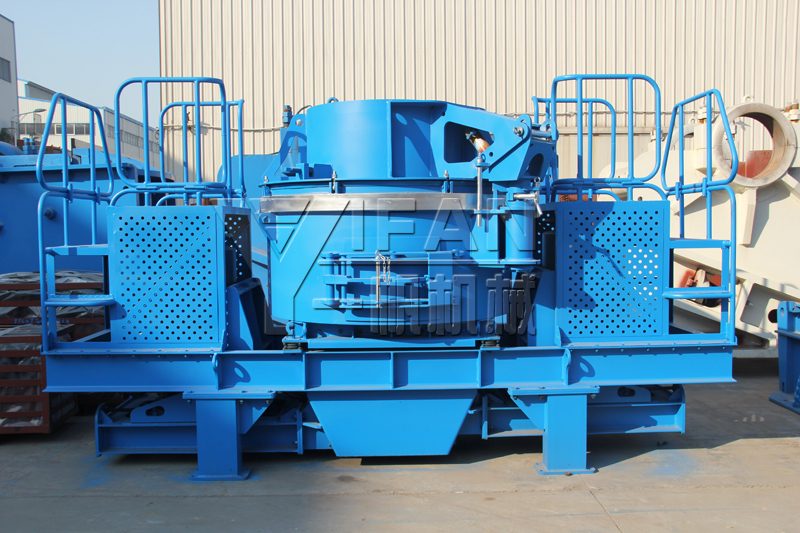 Such a material whirl crushing chamber by two or even several chances impact, friction and grinding crushing effect. Material was broken by the lower row of the discharge port. Throughout the crushing process, the material self mutual impact crusher, not in direct contact with the metal element, but with the lining material occurs impact, friction and grinding, which reduces the angle of pollution, prolonged mechanical wear time. Whirl chamber airflow from circulating inside cleverly eliminates dust pollution.Materials fall into the hopper, the central feed hole into the high-speed rotation of the rotor after full acceleration and thrown into the mouth after launch, the first free-fall and rebound part of percussive material, and then with the impact to the surrounding vortex chamber vortex-like material lining on (or back on the block), the first to be bounced back to the top of the crushing chamber, the latter deflected downward movement, and emitted from the impeller material impact to form a continuous material curtain, and finally through the lower row of the discharge port .